Your flammable chemical storage should be designed for the protection of your personnel, reducing fire hazards and providing the means to suppress chemical fires. Pertinent warning signs and an efficient escape routes alert personnel to fire hazards and enable them to quit hazardous areas without harm. Preventing chemical fires is essential to workplace safety. 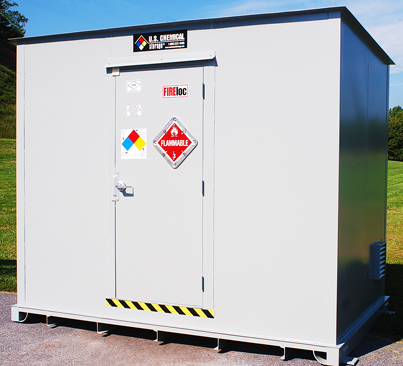 Your flammable chemical storage building should be designed to lessen hazards, complete with fire suppression systems to quickly control or extinguish fires. A flammable storage building should enable you to store your flammable or combustible materials with hours of fire safety. Hand-welded 12-gauge steel provides increased protection with revolutionary structural strength. Additionally, leak-proof containment can prevent any leaks or spills from escaping your flammable chemical storage building, reducing the risk of dangerous chemical reactions. Additionally, climate control is available to help maintain your chemicals, ensuring a safe environment within your storage area. Reducing the risk of a chemical fire, your flammable storage should be maintained with the proper accessories, in addition to good housekeeping. Good housekeeping in chemical storage serves to minimize obstructions and reduce the possibility of a chemical reaction while enabling personnel to quickly identify any leaks or spills. To minimize fire hazards, it is important to segregate your flammable materials. Flammable chemical storage should be kept separately from oxidizing agents and any potential source of ignition, in addition to any other incompatible substances. Whether you intend to store your flammable materials within your facility or without, we have fire-rated construction to help you achieve your goal. We’re here to facilitate the flammable chemical storage process, to help you attain compliance, and to provide unmatched protection. Adhering to regulations and using only approved construction, our building are engineered with the highest safety standards to protect your personnel as well as your reputation.